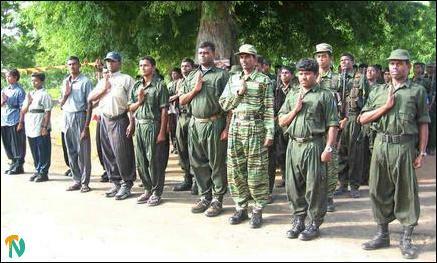 The ceremony which started at 9.30am was presided by K.Kamalaruban, a member of LTTE. 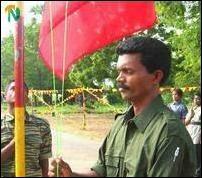 Aandankulam LTTE commander, I.Markan, lit the ceremonial flame and Commander N.Jeyam hoisted the Tamil Eelam national flag. 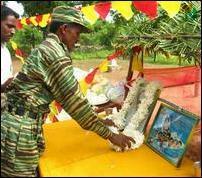 Martyr 2nd Lt.Abina's mother Ratnam and Commander of Visalan Brigade K.Sampanthan lit the flame of scrifice. Assembled residents of Batticaloa district and LTTE cadres sprinkled flowers and payed floral tribute to the pictures of the 10 martyrs, source attending the ceremony said. In the public meeting following the opening ceremony, Aandan Kulam Head of the LTTE Women's Political Wing, Nitharsana, Teacher at the Panichchangkerni Vidyalayam, S.Shanmugam, Civil servant at Vakarai Pradeshya Sabha, A.Yogarajah and AndanKulam Head of the LTTE political wing, S.Thothiran spoke. Pannichchangkerni Head of the LTTE political wing, N.Vimalan, concluded the event giving vote of thanks. 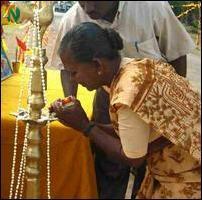 Red and yellow flags decorations were seen in most of the Batticaloa district through the day, residents said.